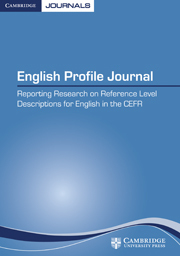 The English Profile Journal (EPJ) is a public domain journal whose aim is to share the latest research resulting directly from the English Profile Programme. EPJ will publish articles, plenary talks, notes, and reviews related to English Profile. Setting standards for English language learners, English Profile is a research programme registered with the Council of Europe that aims to provide a detailed set of Reference Level Descriptions linked to the Common European Framework of Reference (CEFR) for English. English Profile's core partners are the University of Cambridge, the University of Bedfordshire, Cambridge University Press, Cambridge ESOL, the British Council, and English UK. The wider English Profile Network consists of a growing number of academics, government advisers and education professionals around the world. EPJ is closely linked with the website for English Profile, www.englishprofile.org and abstracts from articles will be published on the website.